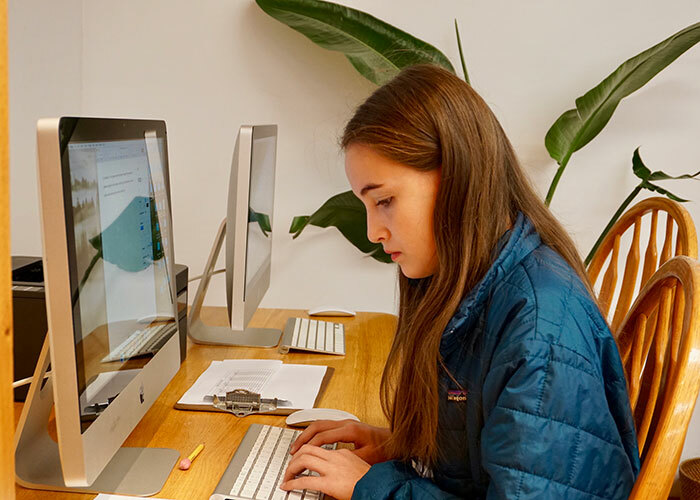 In a previous blog post, A Montessori Guide to Technology and Teens, we explored how we can help our adolescents begin to use technology responsibly, as part of adapting to the adult world. Here we will discuss a Montessori perspective on the role of technology and screen time for younger children, under age twelve. These days, messages from marketers are strongly pro-technology for children, and even some educators are strongly pro-technology. Everyone has their own experiences to base their judgments on; if you’ve seen negative results in your own family, you might look to the current research to validate your sense that technology is not a good fit for childhood. Conversely, if you’ve had positive or neutral experiences with your children using technology, then you probably think people are going bananas over something minor. Either way, most parents don’t have the time to conduct a thorough Ph.D.-level investigation before deciding whether their child can have that video game or the latest digital device they just opened under their grandparent’s Christmas tree this year. So, what are we to think about this debate over technology for children, and what do we want to steer our children towards in our own homes? When we look at this issue from the perspective of a Montessori approach, we consider: what children need for optimal development, the importance for a child of building their foundation for life, preparing your home environment, basing your decisions on observations, and keeping your long-term goals in mind. Dr. Montessori pointed out that under the age of six, children need reality so that they can form their understanding of it. They need to touch, feel, taste, smell, move and experience the real world. Human beings are sensorial learners when young. From their sensorial explorations, young children learn things about physics, textures, and qualities of the world. Consider that no screen can provide this information in a natural or full-sensory way. Children need to discover for themselves what kind of structures collapse under pressure and which ones don’t, and to figure out why by exploring and experimenting. To be effective, this has to happen in reality, not virtually. Dr. Montessori wrote, “There are many who hold, as I do, that the most important period of life is not the age of University studies, but the first one, the period from birth to the age of six. For that is the time when man’s intelligence itself, his greatest implement, is being formed… The child has an intelligence of this unconscious type, and that is what brings about his marvelous progress. It begins with a knowledge of his surroundings. How does the child assimilate his environment?” (The Absorbent Mind). The young child does this with an intense sensitivity, awareness of, and interest in all that is around him, and this is accomplished with an absorbent mind that seems to soak in information with ease. Between ages six and twelve, children are on a quest for intellectual information and want to seek it out for themselves. They continue to explore with curiosity, but now on a more sophisticated level. They actively form their reasoning abilities and social cognition. They need to play with other children to figure out how to get along, strengthen their bodies, and build things from their imaginations. Children these ages need to play with other children and interact to develop their own skills of collaboration, reading social cues, and communication. There is no virtual substitute for this kind of learning. The more time spent developing these abilities, the more adept a child will be. Some parents will wonder, “But how will my child know how to use the computer well? He will be so behind his peers!” Joe Clement and Matt Miles, co-authors of Screen Schooled: Two Veteran Teachers Expose How Technology Overuse is Making our Kids Dumber, explain that this is as silly as thinking that anything having to do with technology today will be the same by the time our children are adults. They ask, “What lessons in technology are we going to teach five-year-olds that will still be relevant when they enter the work force sixteen years later? This would be the equivalent of elementary schools of the 90s replacing time spent teaching reading, writing, and arithmetic with lessons on how to program your VCR.” Instead of spending time with technology, we need to allow our children to focus on building themselves as learners, thinkers, explorers, and communicators. Here we have to stop and ask ourselves, what did parents used to do at such times? Sure, our lives are more hectic than perhaps in the past, and parents may be more stressed, but these are very important opportunities, if you can see them as such. Recently, I sat down on an airplane and a young mother sat across the aisle from me with four little children. She had an infant on her lap, a two-year-old, a three-year-old (I picked up that this was a cousin), and a five-year-old in seats alongside her. Holy cow, I thought, this is going to be a loud, stressful flight! But just as I assumed this mother would pull out some screens to get everybody occupied, she started talking with them. She played itsy-bitsy spider, she asked them questions, she hugged and kissed and laughed with them. I noticed that this mother was not the source of the children’s entertainment, however. She was calm, quiet, and relaxed. The children climbed around, played with toys, talked to each other and colored on a coloring book throughout the flight. There was some crying, and this mother naturally looked fatigued when it was time to de-plane. But I marveled at how she had taken this time with her children to interact with them. This was two hours of language development and learning how to relate. This mother had chosen to just be with the children. Because they were not all competing for her attention the whole way, it seemed that they were probably accustomed to entertaining themselves. This is key: our children will NOT learn to entertain themselves or calm themselves if their long, boring, or uncomfortable moments are filled with screen time or a digital toy. This is an incredibly important skill, one that comes front and center stage when children feel anxious, worried, or self-doubting. While young adults in college are reportedly having a harder time than ever with anxiety, stress, and depression—so much so that the University of Chicago, Stanford, and many others now offer undergraduate courses in learning to handle strong emotions—our children need to begin learning these skills, naturally, from very young ages. We cannot know for sure yet, but it seems logical that the constant use of smart phones, laptops, tablets, etc. could be a factor in this trend of anxiety;the first thing experts recommend to calm one’s mind is to focus on your breathing and to notice the present moment…and to put those devices away. How about other parental concerns, such as, “My son feels weird when he isn’t sure what other kids are talking about outside of school,” or, “We go to my daughter’s cousins’ house, and they cannot take their eyes off the screens. My daughter ends up lonely because they won’t stop playing their video games and engage with her.” My advice is to talk to your children (and your relatives) about ways to respond to this. Suggest an experiment: let’s see what the children do and how they act after a couple days together without technology. After initial protest and boredom, most children will surprise us by enjoying the things that all children enjoy—playing creatively and interacting, using their imaginations, and being physically active. Letting them come up with the ideas of what to play and how to play fosters an appetite for more of the same. Here’s another concern: “My son stares at screens in the airport and in stores. Maybe if we let him spend a little screen time at home he wouldn’t be so attracted to them. He’d get over the allure.” This sounds logical, but because of the apparent addictive nature of technology, especially for young children, this is not something you de-sensitize your child to. The focus needs to be instead on maximizing your children’s natural interactions and experiences in life, making them stronger and more capable of controlling themselves when they face temptations. The warnings about the addictive nature of technology for children are growing, and the only ones protesting are the marketers. When you see pro-technology test results, check to see who funds that researcher; most often, it is a tech company. The unbiased research that is coming out every month now strongly shows negative effects on children. Another common belief is that technology use is all around us, it is part of our world, and it isn’t going to go away, so we have to learn to live with it. This may be the case, but learning to live with it should not mean allowing our children or ourselves to develop addictions to it. There is a growing awareness in the past year about how drained, anxious, overstimulated, irritable, or burned out people feel after using technology for many hours. We are now seeing a wave of interest in controlling our use of technological devices with programs and apps, rather than letting them control us and our behavior. We will continue to learn more about how to live with technology as such an integral part of our daily lives. In the meantime, I urge parents to stick with what we know is healthiest for our children’s development. The early years are critical in building the foundation for their lives. Technology is changing rapidly, but the needs of human beings are relatively consistent and do not change. To understand how developing themselves as people will set our children up to be the innovators of the future, turn to Walter Isaacson’s The Innovators, an excellent book about “how a group of hackers, geniuses and geeks created the digital revolution.” What struck me most about this fascinating story of the evolution of computers is that the people behind these machines were creative thinkers and collaborators. The very skills that drove their success as computer designers were ones that develop away from computers in childhood. In adulthood, we are ready to think more abstractly and build off of the base of our abilities of concentration, teamwork, reflection, imagination, and understanding of the physical world and how things work. Abstracting is a leap of the mind that happens because of all that has come before. Building this base is where our focus needs to stay with children. This is why tech experts in Silicon Valley keep their own children off screens at home and deliberately choose low-tech schools. (See the articles Silicon Valley Parents Raising Their Kids Tech-free—and it Should be a Red Flag and A Dark Consensus About Screens and Kids Begins to Emerge in Silicon Valley .) If these are the choices of experts at the forefront of the technology industry, parents would be wise to take notice. “Isn’t technology just part of the prepared environment my child is growing up in?” The key word here is prepared. 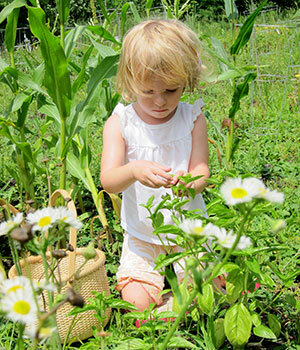 Children do learn from what they are exposed to in the environment. What Dr. Montessori referred to as a prepared environment for children to learn from was the emotional, social, psychological, and physical environment that surrounds them. Young children learn through direct interaction, facilitated by their five senses: touch, smell, taste, hearing and seeing. The more senses are integrated in use simultaneously, the more complete the learning experience, and the more attentive a child’s mind becomes. This is attention directed by one’s own will, a very important step towards developing self-control and self-discipline. Parents must ask themselves if a screen provides an environment that has been prepared for their child’s best development. Has the content been prepared to be suitable and to match his/her developmental needs? Or is it designed by experts—whatever their degrees and expertise may be—to allure children and make them want more and more? The more time a child spends with technology, the less time is being spent directing their own will or making their own decisions. Furthermore, they are sitting without moving while thinking. 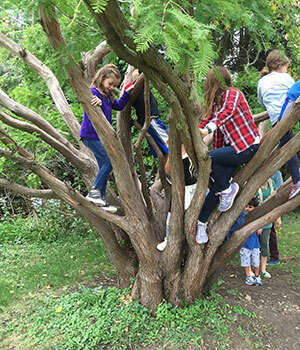 As Dr. Montessori pointed out, “When there is motor and physical activity, you can see a more important kind of education, a kind of education that takes the force of life into account…If we do not take [this] into account, we miss the best part of education” (London Lectures). In this sense, “education” is all the learning our children do throughout their days. Since Montessori made her initial observations about the importance of movement in the learning process, there has been an abundance of research that shows that movement and cognition are intertwined. For a review of the research, see the chapter on movement and cognition in Dr. Angeline Lillard's book Montessori: The Science Behind the Genius. Dr. Montessori’s work was built upon her observations. She watched children interacting with their surrounding environments and made discoveries based on these careful and repeated observations. I encourage you as a parent to make your decisions about how your child is responding to the environment, or to technology, with careful observations. Is your child—of any age—more relaxed, alert, rested, cooperative, content, curious, and communicative after spending time on a screen? If he or she is irritable, flitting from thing to thing with little concentration, easily frustrated, or impulsive, these may be clues as to how the screen time affects him or her. Young children are far more sensitive than adults, as they are sensorial learners. Their nervous systems are more sensitive. As adults, we need to be aware and responsive to how technology affects them. Children differ as individuals, and some may handle screen experiences with very little observable effects while others are thrown off for days in their mood, behavior, and impulse control. For sensitive children, it is totally unfair to expect them to handle exposure to screens and then to control themselves and forget about the stimulation they just received. As suggested by recent research and Richard Louv’s Last Child in the Woods, time outdoors in nature encourages reflective thought and helps us to feel refreshed and calm. Likewise, getting our children out into the woods—to smell the air and flowers, experience the mud and leaves, see the sky and clouds, and hear the birds and wind—will have positive effects on their moods and outlook. Take notice of how your young children behave and feel after such times. Our goal is help our children develop a strong ability to focus and concentrate. This will be put to the test when they are surrounded by distractions. As a Forest Bluff alumna recently told us, this ability to focus is critical for her as a medical student working in the hospital atmosphere, with so much going on all around and stressful pressures. She notices that many people have trouble sitting down and staying focused to get very important work done, even in medical school. This ability is one she says she formed as a child at Forest Bluff, during invaluable years of brain development. We as parents need to prioritize concentration, not only for this reason, but because all learning depends on the foundation of being able to attend—to focus one’s attention and stay with a train of thought by one’s own power—in order to be productive in a meaningful way. "With sudden or novel stimulus, like a ball moving across the screen or a page-change instantaneously from a button press, our biological response is that the blood vessels to the brain dilate, and the blood vessels to other major muscle groups constrict. Cortisol is released, heightening mental arousal and sharpening visual and auditory perceptions, and attention is heightened. Evolutionarily, this response protected us when we heard the rustling of a tiger. In television advertising, it’s used to sell products. And on the short-term, it appears to work. The problem, of course, is that the child becomes habituated to these jolts and loses their natural capacity for attention. In Montessori, the whole focus is on developing a child’s intrinsic capacity for attention. The ability to learn derives from the authentic development of that capacity. To compromise attention in order to learn math more quickly is like killing the goose that lays the golden eggs." When you have established capacity for attention as a developmental priority, align your decisions with your desired outcome. Technology rapidly changes every year, and we still do not know what the long-term effects of our daily use will be, especially in children. Why take a chance through this experimental phase? We have enough discouraging information already about the negative effects of technology use and so few positives to make those risks worthwhile. See the references at the end of this article for research that gives compelling reasons to be concerned about how technology is affecting learning, brain development, and social interactions, specifically the Wall Street Journal article How Smart Phones Hijack Our Minds and the Developmental Psychology article Learning on Hold: Cell Phones Sidetrack Parent-Child Interactions, both of which cite other related reports. Based on our experiences over the past 35 years with children and the growing body of research on how technology use is negatively affecting young people, we strongly urge parents not to give technology devices to their children enrolled at Forest Bluff, including screen time at home. For excellent research on how brain structures are negatively impacted by screen technology, read How Has the Internet Reshaped Human Cognition? When children are developing their brains and learning to function, control their impulses, regulate their emotions, pay attention, and remember new information, they need real life experiences. Our children will all see screens and might occasionally play with a friend’s or a relative’s device when in other people’s homes. But we do not recommend giving your child a device or granting them screen time in your own home on computers, phones, TVs, handheld digital devices, etc. There are so many other wonderful ways to spend time that will give your child the developmental advantages of building creativity, powers of reflection, curiosity, interest, physical strength, empathy, and relationships. A healthy approach is to build on a strong, intellectually rich childhood before entering the world of technology. Our children are forming the foundation for their characters, choices, and intellects from time spent outdoors being physically active, reading, in conversation, and contributing to the life of their homes by collaboration. First and foremost, they are learning how to be good people. As devices such as laptops, smartphones, and tablets become more prevalent in our lives, parents can look to Montessori for guidance on how to handle technology and teens. As our families leave the comfortable world of our Montessori grade schools behind and enter high schools, with new parenting challenges to face, we can look to the Montessori approach we have found so useful and apply it to this new landscape. Adolescence is a stage of life that necessitates new freedoms and adjusting boundaries, as our children begin to join the adult world with growing independence. Considering the basic tenets of the Montessori approach, this means we’ll provide support and some scaffolding, model for our adolescents, link them to the best of this adult world, and provide expanding freedoms with reasonable and supportive boundaries. Let’s apply this approach to a well-known struggle most of us share when our daughters and sons enter high school: what to do about technology use. I hear too many parents lament that their 14- to 17-year-olds seem “addicted” to technology, huddled over their iPhones and laptops for hours at a time, irritable, stressed, and often distracted. A push-and-pull drama unfolds, where parents and teens struggle to figure out what limits and “rights” are reasonable, on both sides. Here we’ll suggest things that can help you get off to a better start with teens and technology. Until they graduate from Forest Bluff School, our students really do not need to use computers or smartphones. In fact, there are many reasons we recommend holding off on technology exposure for children, which we will explore in a future blog. Our Forest Bluff students learn to touch type and use the computers in our Secondary Level like any other piece of classroom material, with support and supervision. Then, as our children head off into high school, a laptop computer and in some cases, a smartphone, may become necessary. 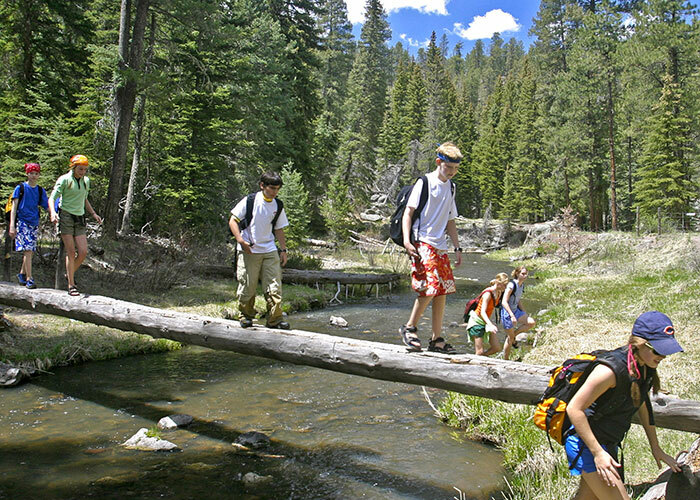 Because technology is very much a part of our adult world, and developmentally, adolescents can think more abstractly, high school is a logical time for our children to begin using it beyond learning to touch-type a paper or planning a Secondary Level trip. Now it can be a tool for communicating, collecting information, and creating. After having the first stage of adolescence (middle school) under their belts, when learning to read social cues and expressions more accurately is key, high school students are more ready to find the power of the written word when there are no physical expressions to inform them. They are developmentally ready for the abstract world of technology and the gifts it offers to adult--and evolving adult--minds. A word of caution, however: adolescence is also a time of increased distractibility, when the brain is undergoing big changes that make it more open and vulnerable to addictive behaviors (see Brainstorm, 2015). The tendency to overuse technology must be taken into account and should be a topic of conversation with your children before problems arise. The desire to connect with friends and be part of a group drives teens towards their iPhones and computers. This makes it an important time to help them stay aware of what else is going on around them and involve them in family and community life. At home, we encourage parents to emphasize intellectual life, spending time outdoors, being physically active, reading, conversing, and contributing with chores and collaboration as a family. As an example, my own 13-year-old daughter and 15-year-old son have dinner with my husband and me every night, with each member cooking a weekly meal from scratch. We all pitch in on the clean up. Even though it can be a challenge with homework, sports, and busy schedules, we continue to come back to these basics of family life and are always grateful to find how this feels. Especially now in these teen years, we work hard to prioritize these habits of how we spend our time. It really pays off. Adolescents will naturally want to stretch away from their families but still need the home base; they need to feel that they are necessary to their first core group. As technology competes for their attention, ask your adolescent to participate in more adult-like roles within the family, like driving, doing an errand, planning the logistics of a trip, caring for an elder or younger person, and sharing more of the load that the adults are carrying. This fundamental connection with the family unit and sense of responsibility is so important to emotional, social and physical health. There is good evidence that developing life skills and connecting with family and community in the teen years aids confidence and supports academic success. Whenever I have asked veteran moms for advice on raising teens, the first thing they invariably say is, “keep them close,” and I believe this is what they mean. 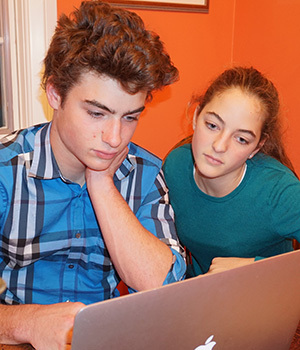 When you give a laptop computer or other electronic tool to your adolescent, fix it the way you would like it to be used: block inappropriate sites, remove features you do not think your child should use, and put parental controls in place that allow you to adjust the hours and amount of time the computer will function. Some families choose to turn off their internet at a certain time each evening or plug all their devices into chargers in a central, confined location, so that nighttime is guaranteed to be tech-free. It is worthwhile to find a professional who knows the latest apps children use and who is thorough in covering what you need. You can also use an application like Disney Circle or Net Nanny, which enables you to set parameters on screen time and use for all family members. The purpose of preparing the tech environment is to remove the need to be controlling and micro-managing. Set things up from the get-go to be used how and when you think is best. Then there’s no negotiating or issues. The parameters do the work. Next, present any device as a useful tool and talk about your values when you gift one--this is your moment! 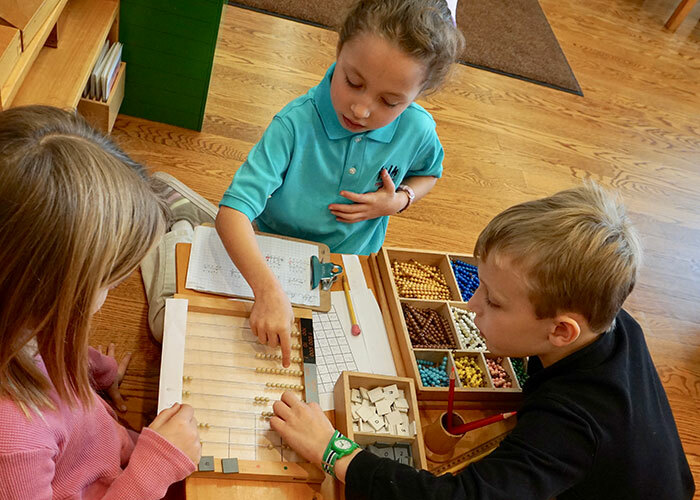 Ben Moudry, a Montessori child who became a Montessori teacher of adolescents and head of a Montessori school, observes that the students who were given technology when they were younger often see it as a toy for games and entertainment, rather than a tool. “They constantly goof around on the computer, so it’s become a habit that’s hard to break,” he says. But if their introduction to technology was as a tool to use for learning, Ben sees that they have a different attitude, one that helps them make better use of it in school. Because so many computer “learning programs” are like games, they can also create this association of entertainment. When we talk about using the computer as a tool, we’re referring to writing papers, searching for and reading research, building graphs, designing programs and the like. Realize that no smartphone or computer is a “right.” It is a luxury, and if you, the parent, are giving one to your child, it is reasonable to explain that it’s your money and your decision. A device comes with your conditions and can be taken away. It also should be given with instructions on how to use it properly and what your clear expectations are. It is useful to decide together what the guidelines ought to be and make an agreement, as an offshoot of your conversation about what temptations may come up. If you think your child may be fuzzy about the guidelines agreed on, type them up to refer to. Look at this as a contract. This may sound unnecessary, but I cannot tell you how many parents wish they had started out this way, as they end up there after much frustration and disappointment. Start out more clearly, and you won’t regret it. 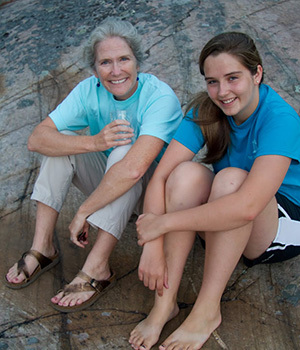 Talk with your child openly about why adolescence is a time of greater distractibility in life, that you know other teens who have struggled to “unplug” from their devices, or that you yourself have challenges with doing so. Ask, “What guidelines do you propose that you think can help you avoid these things for yourself?” (If your child is not mature enough to engage in this discussion and follow through by typing up a short list of good guidelines, that’s a definite sign that they are too young to handle freedom with technology.) You may want to shorten, simplify, or adjust the list. Make it simple and help your child set himself/herself up for success. Share your values by living them in front of your children and talking about what’s most important to you. Mealtimes, bedtimes, in the car or on walks, are moments for connecting, telling stories, asking questions, sharing your thoughts and listening to your children’s. Turn off your devices and put them away when together, be demonstrative about your priority; adolescence is a crucial time to be emotionally and cognitively “present” for your children. As adults, we can now set limits on our own technology use: We can set our own phones up so that we cannot text or use the screen while driving cars and our computers so that they do not alert us when new emails arrive while we’re working. What has been a free-for-all can now become a more controlled experience for us. As adults, we can make these choices to restrict ourselves--and do so--because we desire work spaces and times without constant interruptions. But children are not coming at this from the same perspective, with the many years of self-control and choices that we have under our belt as adults. When a parent gives a child or adolescent a device and simultaneously tells them that they need to control their use of it by their sheer willpower, we are asking something most of them are going to struggle with--a lot. Their constant failure with this can be disappointing not only to you, but also to them. With the news on how technology is specifically designed to capture our attention and make us use it more and more, it is incredibly unfair to give it to young adults and expect them to control their use with adult-like strength. Much better to begin with boundaries that will help our adolescents to expect that this scaffolding is useful and necessary, even for adults. Also model your manners with your smartphone or computer. Put it down, turn it off, and interact with people when appropriate: when in a restaurant together, at check-out counters, at social functions, or when having a conversation with someone. Model alert and aware behavior when walking through a city, crossing a street, or getting in or out of a train, bus, taxi-cab or Uber ride. Adolescents may not be watching us with the same absorbent minds as young children or the analytical minds of elementary aged children, but they are looking to us as immediate examples of adult behavior as they are becoming adults themselves. Our young adults need to see us make clear decisions about technology. Handing tech devices over to children without limits built in may seem harmless when you see other parents doing it. But as we see mounting evidence from families we know, and substantial research pointing to the issues arising from doing this, parents are backtracking to set limits. So, supply some clear boundaries, such as which rooms in your home devices can or cannot be used in. For example, it is advised to keep electronics out of the bedrooms for a lifetime habit of protecting that space for sleeping and relaxing. It is also widely advised to prohibit bringing them to meals, so that everyone engages with each other, and not their devices. These two are common ones. Beyond that, some families have other specific boundaries. In our own house, for instance, we keep the laptops in the kitchen, library, and office--study areas that are in the lower level of the house. We don’t bring any devices or laptops upstairs, which is where our bedrooms are. My husband and I follow the same guidelines as our children. For a child in middle school (ages 12-14) we recommend keeping computers positioned where you can see the screen. I know many families who did this and were glad that they were able to establish good habits, especially with emailing, texting, and Face Time. Nowadays, we can check a computer’s history through the parental controls feature (in settings) and see what the user was doing, but many parents may still want to be around with younger teens. This also sets the tone that a computer is not a privacy right; it is an interactive and social device that’s open to audiences. Realizing that their computer activity is seen by others, whether from the exterior or interior, is an important message. If your aim is to support your adolescents to develop their abilities of concentration and self-reliance, then align your decisions with this outcome. Support developing concentration by maintaining that computers are tools for writing papers, building graphs, and doing other thoughtful work. And encourage self-reliance by making computer and smartphone use realistic. For instance, one guide for the timing of getting an iPhone is when a high school student can handle the financial responsibility; one of my older sisters told her children that they could have iPhones when they could purchase them and pay for the call plans on their own. With money from their first jobs, her teenagers did this in high school, and they took very good care of those devices! The girls received their bills each month, and my sister and her husband taught them how to pay them with their own wages. This was an empowering experience that helped these adolescents learn more about how adults function. They understood the responsibility of the freedom. Rather than feeling they were being punished by not being gifted the devices, these daughters saw their parents’ actions as a way of helping them enter the adult world with realistic expectations and awareness of their own abilities. When our children become young adults, they begin a process of using the tools we use in everyday life; along with this introduction must come the ways we keep ourselves focused. Dr. Angeline Lillard has been a professor of psychology at the University of Virginia for over 20 years, and when she saw that her students could not seem to control their laptop or smartphone internet use in the classroom, she banned them during lectures. The research coming out at the time was showing that we do not retain information as well when we type it as when we handwrite it (Mueller & Oppenheimer, 2014). Therefore, Dr. Lillard did not believe that the students needed their laptops to take notes during her lectures (with some exceptions, of course). There is also strong evidence that being distracted--as we are when messages come in on our devices--doesn’t just interfere with learning new information, it can actually block it. Prohibiting smartphone and laptop use in the classroom was novel for the early 2000s, but as Dr. Lillard’s teaching assistants sat in the back row and excused offending students from class, she noticed the quality of student work and participation increase convincingly. More research in recent years supports this observation (see the articles listed below, which cite many studies). The students enjoyed Dr. Lillard’s class more and actually thanked her for setting these guidelines to keep them on track. Today, many of Dr. Lillard’s colleagues at UVA also require that students not bring laptops or smartphones to lectures and class discussions. It’s just a matter of time before all educators find that any classroom designed for group discussion and learning in lecture format is no place for smartphones, laptops, or any other kind of screen that distracts the participants from what they are there to do: learn from a teacher and each other. Teachers who are using technology interactively in their classrooms may have another perspective, but as long as a classroom teacher cannot see what is on their student’s screens, the temptation to shop for new shoes, Snapchat a friend, or check Instagram while they look like they are “taking notes,” is too strong for many. Such activity detracts from their own learning, and because it influences participation, it also affects the learning of their classmates as well as the entire class atmosphere. 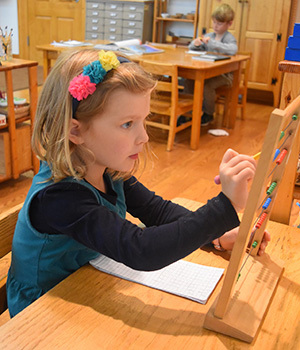 We know that what makes Montessori classrooms so impactful is the emphasis on developing the ability to concentrate. All learning is based on this premise: that one who can focus can think. This is why protecting learning spaces for focused concentration and thinking must be the aim of educators, as well as parents at home. As a stream of research in recent years links anxiety, depression, and a compromised ability to focus to unrestricted technology use (see Irresistible, 2017), parents must take precautions before handing devices over to their children. Pause to think of Montessori’s explanation of the characteristics and needs of each stage of childhood. Adolescence looks like the most logical time to introduce technology as a tool for adult life, despite the fact that increased distractibility is a characteristic of this stage of brain development. Before you begin down the technology path, prepare your home environment in some important ways so that your child is supported and set up well. Model with your own technology use, and demonstrate how you actively curb your use where necessary. Provide freedoms thoughtfully, and set limits with care. Remember that freedoms can and must be given in steps, so that children have the chance to respond with increasing responsibility. And finally, give your adolescent scaffolding for practicing the best habits. Technology is no different from any other new landscape when you look at it this way. The basic principles of the Montessori approach have much to offer us in these new adventures! Carr, N. (2017, October 6). How smartphones hijack our minds. The Wall Street Journal. Mueller and Oppenheimer. (2014). The pen is mightier than the keyboard: Advantages of longhand over laptop note taking. Pyschological Science, 25, 1159-68. Loh, K.K., & Kanai, R. (2016). How has the internet reshaped human cognition? The Neuroscientist, 22(5), 5-6-520. What is "Brain Hacking"? Tech Insiders on Why You Should Care. Anderson Cooper/CBS News, 60 Minutes, April 9, 2017. Click here for a printable PDF of this file. As technology develops and allows scientists to study the brain in new ways, Maria Montessori's theories are finally being validated by modern science. In this article for The NAMTA Journal, Paula Polk Lillard surveys the work of neuroscientists of our time and celebrates the fact that "we can now have hard evidence that human beings construct their own brains in collaboration with their environment, just as Montessori proposed one hundred years ago." In this enthusiastic dinner presentation to the Fourth Adolescent Colloquium, Paula Polk Lillard surveyed the work of neuroscientists of our time, which concurs in every way with the developmental perspective of Montessori education. 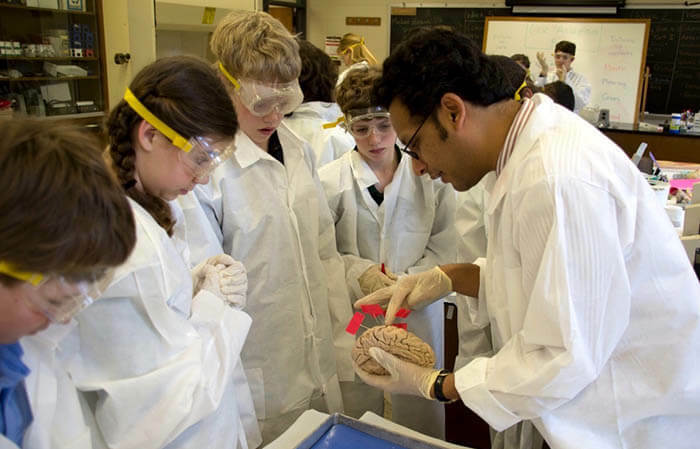 “We can now have hard evidence that human beings construct their own brains in collaboration with their environment, just as Montessori proposed one hundred years ago.” Furthermore, as Montessori education continues to expand into the frontier of the Third Plane, it is crucial to keep in mind that the forebrain, seat of judgment and self-control, is still being developed during adolescence. Paula Polk Lillard is the founder and Head Emeritus of Forest Bluff School. She has authored several books on Montessori theory and education and is a frequent speaker and contributor to Montessori journals and publications.